This is a 2005 Cartier Louis Cartier Limited Edition No. 6 cartridge/converter-fill in solid 18K gold in Godron (heavy fluted) pattern. Three sapphires and two emeralds set into the clip. Black cabochon on barrel bottom. Two-toned, 18K, medium/fine nib. New-old-stock. Mint in box with velvet pouch, papers, outer box and letter of authenticity from Cartier. Check out our Catalog to view this item’s availability! Item #8 in Catalog #86. 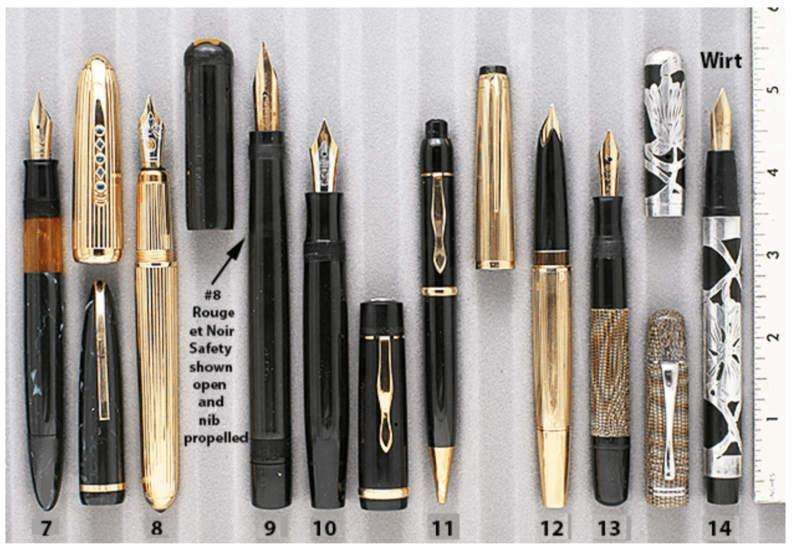 This entry was posted in Modern Pens and tagged Cartier, Catalog, Catalogs, Extraordinary Pens, Fountain Pens, Go Pens, GoPens, Vintage Fountain Pen, Vintage Fountain Pens, Vintage Pen, Vintage Pens. Bookmark the permalink. Follow any comments here with the RSS feed for this post. Post a comment or leave a trackback: Trackback URL.